The stat line read: MIN PLAYED: 2 3FGA: 4 3FGM: 2 PF: 0 TP: 6. Not bad for a basketball player but hardly Lebron-esque. 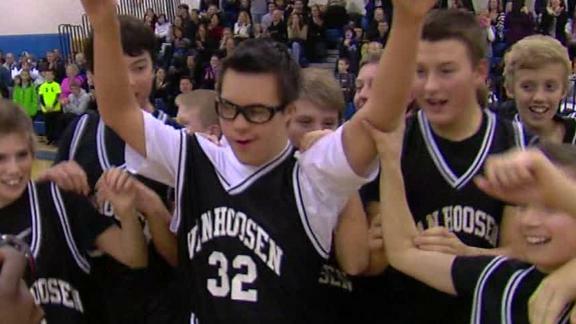 But for former equipment manager turned basketball player Owen Groesser it was indeed remarkable. Owen plays for Coach Jeff Howell’s Van Hoosen Middle School seventh-grade team in Rochester Hills, Michigan. In the final home game of the season, Howell asked Owen to put down his stat sheet and suit up for the game that would decide the city championship. Owen was ecstatic especially since he’d been practicing at home with his dad all year just to enjoy shooting around with the guys during the practice sessions. Now he had a chance to play in a real game before his friends and teachers. With about two minutes to go in the first half, Howell called Owen’s name and put him in at the 2-guard position. The crowd was chanting his name as Owen came off a pick and swished a three-pointer from what we old timers call “way downtown,” or just beyond the three point arc. Continually fed the basketball by his teammates, Owen missed a couple of shots but on his last trip down the floor set up and hit another “3-Ball” as time was running out. The crowd first erupted and then later rushed the floor to congratulate their classmate. Pretty mundane stuff to justify a blog article? Maybe, but what makes Owen truly remarkable is that Owen is more than a manager who got a chance, he’s a kid with Down’s Syndrome who got a chance. Proof again that humans can do some remarkable stuff when given the opportunity, and that people know a hero when they see one. Owen’s shot made it to ESPN’s SportsCenter and garnered thousands of tweets. Owen, however was unruffled. When congratulated by his beaming dad for the good shooting in a championship game he got the reply familiar to any of us who have raised kids. “I know that, Dad,” Owen said. And boy was he right, and not just for those who witnessed it live. In case you were wondering, Van Hoosen won the game, 35-26 which, of course, makes Owen a champion but we already knew that didn’t we? Frank, I cry like a little girl when I watch Hoosiers. My bad, Mark, pls feel free to edit my comment if you can–it won’t le me. You helped to build a foundation from which he soared … well done, Dad, well done. A great video clip! That locker room is amazing! It makes want to go find my dvd of Hoosiers and watch it on this cold and wintry mix of a day here. I so value stories where someone like Coach Howell understands individual effort, motivation, and spirit and cares enough to involve everyone in order to make it a real team effort … no matter what the results of the game may be. Bravo. Everyone’s response was heartwarming and so uplifting. Thank you, Mark. Hoosiers is one the best movies of all time! Thank you so much for posting this heart warming story! WOW! Reminded me of Hoosiers when Coach Norman Dale put in Ollie,part time player and team manager, who was fouled and made the free throws. mespo, I can always tell a person who has a good heart. A quality that in my mind trumps all others. You’re history of finding stories like this shows your goodness. You are a righteous leader here. Thanks. You mean unruffled, Jonathan, not nonplussed, which is just the opposite.